Sue McDonald is a qualified, Goulding Certified SleepTalk™ Consultant. Sue was trained in the early nineties by the creator of the Sleeptalk™ process and founder of the Goulding Institute, Joane Goulding. Sue was selected as Joane’s key SleepTalk™ Consultant in recognition of her passion for people, sharing and training. Sue now has extensive experience in supporting parents as they learn toimplement the SleepTalk™ program with their children. SleepTalk™ is a completely safe and powerful process for parents which takes just afew minutes with your child each night. 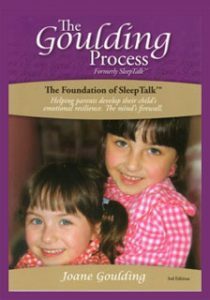 The program is explained in Joane Goulding’s book and CD set, Sleeptalk™ for Children, which can be purchased online here. SleepTalk™ allows parents to deal with issues that are relevant to children born in the last 12 years gently, safely and effectively. SleepTalk™ for Children is for all children. It acknowledge that the greatest gift parents can give their children is their loving influence by day, and the positive influence of SleepTalk™ for Children by night. Once the positive messages you give your child as he or she sleeps have been absorbed, they stay with your child throughout their entire life. The Goulding SleepTalk™ process teaches parents how to convey positive, esteem-building messages to children at the most effective time – just after they have fallen asleep. This process has been developed over years to ensure that it is completely safe and works for all children, enabling them the best chance of realising their full potential – no matter what that may be. When you buy your copy of Sleeptalk™ for Children from this site, you receive 3 months free email support from Sue McDonald personally. You may purchase Sleeptalk™ for Children and the CD set here. Contained in Joane Goulding’s book, Sleeptalk™ for Children, are secrets so simple it’s a tragedy that everyone doesn’t know them, and so powerful that it’s not outlandish to describe the results as miracles. If you could whisper in your child’s ear, ‘Your life will be wonderful and happy’ and make it happen wouldn’t you call it a miracle? The information found in this book is for every parent who wants their children to reach their potential – whatever that potential may be. It is for children with difficulties and for children with none. What do Parents really want for their Children? Whether it’s career success, financial security, good health, a stable marriage or any other desirable asset, no great achievement is really possible without good self-esteem, a positive attitude and the experience and acceptance of love. Do you know the Power of Words? Confusion may occur, creating doubt, and a snowball effect of disharmony is created. The Goulding SleepTalk™ process can assist in counteracting this possible confusion and disharmony. The Tools in this Book are Invaluable to Every Parent. There is an easy to read guide of how to instill positive reinforcement through the process of Sleep Talk. The book also comes with a companion CD, which outlines the process in a simple and brief audio guide in Joane Goulding’s own voice, which will help develop the tone to be used in the technique. Joane Goulding has been an educator for more than thirty five years. She has extensive experience in stress management and nutrition, and has specialised in the biopsychococial aspect of stress and mind management. She has published many papers and lectured throughout Australia and in the USA, Singapore and New Zealand. 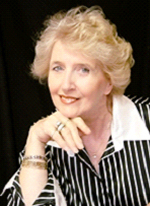 For 22 years Joane was Director of the Australian Academy of Hypnotic Science. The English International Biographical Directory shows her as holding a ‘Distinguished Achievement’ Award and the American Biographical Institute recognised her ‘Outstanding Service to the Healing Profession’. The Goulding SleepkTalk™’ process has been endorsed by leading doctors and psychologists specialising in children’s needs, in Australia and Internationally. Sleep Talk for Children is one of the most useful tools I have used in over two decades of being in clinical practice. Perhaps the most impressive aspect of the process is the way in which Joane considered her ethical obligations to both the parents and the child.